Rolling Fork is the county seat of Sharkey County. It is located in the southern part of the Mississippi Delta a junction formed by the Deer Creek and Rolling Fork Creek. The rich soil in the area allowed settlers to farm cotton, alfalfa, and soybeans. Jewish settlers started to arrive in the Sharkey County area in the 1870s. Rolling Fork itself remained relatively small and undeveloped until the arrival of the New Orleans and Texas Railroad in 1883. As opportunities for commercial trade increased, enterprising Jewish merchants moved there and set up retail stores. A small but significant Jewish community took root and left behind a rich historical legacy. Most notable among them was Sam Rosenthal, who served as mayor of Rolling Fork for over 45 years. In 1875, Ben Pearl came from Russia and settled in neighboring Anguilla to farm cotton. He was joined by his cousin, Henry Kline, nearly a decade later. Kline and his wife Dora farmed with Pearl and started a business called Kline’s Department Store. Kline’s store and cotton business were both quite successful. Successful Jews like Kline often became civic leaders in their communities. Henry Kline served as a member of the Pure Milk Association and as chairman of the Sharkey County Democratic Party. He also taught Sunday school for Rolling Fork’s Jewish children. Kline continued his good work and kept his farm for many decades after he moved his family to Vicksburg in 1921. In the 1880s, Charles Blum started a business in Nitta Yuma called The Blum Co. He served as the Postmaster for Nitta Yuma from 1897-1899. Blum came to the United States from France following the Franco-Prussian War in 1873. Too young to enlist, he sold French pastries to the German officers. Because he knew German, he was able to pass secret information to the French. Years later, he and his wife went on a trip to Strasbourg, and he was promptly arrested by German authorities, but he was subsequently released, as he was an an American citizen. Mayersville, Mississippi, was named after its founder, Mayersville was named after its founder, David Mayer, the Jewish owner of Mount Level Plantation. Located in nearby Issaquena County, it served as a major shipping point along the Mississippi River for both Sharkey and Issaquena Counties during the nineteenth century. Records show that shipments were made to points in Arkansas, Louisiana, Missouri, and Mississippi. Mayersville rose to such prominence that it became the Issaquena County seat in 1872. The town had a spirited existence enlivened by show boats, river crews, gamblers, and traders. Mayersville’s popularity as a shipping port began to decline in the mid-1800s with the arrival of the railroad. In 1902, Theodore “Teddy” Roosevelt came to the Rolling Fork area to go bear hunting with Mississippi Governor Andrew H. Longino. Roosevelt’s assistants, led by Holt Collier, who had been born a slave and was a former Confederate cavalryman, cornered and tied a black bear to a willow tree. Roosevelt refused to shoot the defenseless bear. The story spread like wildfire through newspaper articles across the country. The idea for the world’s most popular toy, the teddy bear, was inspired by a political cartoon written by Clifford Berryman that lampooned the present’s refusal to shoot the bear. Twentieth century Rolling Fork Jews included Edwin Danzig, who arrived in America in 1917 at the age of 14. He first settled in Midnight, Mississippi and then moved to Rolling Fork where he started a dry goods store. He and his family sometimes purchased and resold furs, such as raccoon, mink, and rabbit. Danzig used to ride the train to another community to have his chickens koshered. The Danzig family eventually went into the furniture business in the 1950s. The family store closed in 1995. Rolling Fork was home to other businesses such a Silver’s Dry Cleaners, which operated in the 1930s. Rolling Fork Jews served as bankers and merchants for a variety of retail stores. Before the invention of malls and big box stores, Saturdays were typically the busiest shopping day in small towns like Rolling Fork—downtown stores would often stay open until midnight. Business was so prosperous that merchant Dave Cohen had to use a cow bell on Saturday night to tell shoppers that the businesses were ready to close at the stroke of midnight. 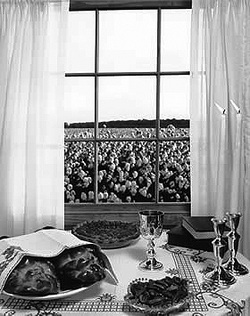 Jews were integrated and accepted into the Rolling Fork community. In the 1950s Bernard Danzig played football with several other Jewish boys. The football coach knew that if the High Holidays fell on Friday night, they would not play, so he scheduled game dates around them. Rolling Fork Jews went to college in places like University of Mississippi and Tulane, and they came to be a part of those communities as well. In 1936, Melvin W. Dovith became president of the Interfraternity Council of the University of Mississippi, the governing body of the 17 national fraternities on campus. He was a charter member and president of the Jewish fraternity of Phi Epsilon Pi. The following year, Elliot Danzig assumed both presidencies as well. Elliot Danzig also held the school's two-mile track record. His grades helped the Phi Ep chapter to win the scholarship cup twice within a three year period. Similarly, Rolling Fork native Amy Weinstein went on to become Vice-President of the Senate for the sophomore class of Tulane University and Chairman of the University’s Multiple Sclerosis campaign. Sam Rosenthal, nicknamed “Mr. Sam,” was born in Brooklyn, New York to two Russian immigrants named Charles and Alice Rosenthal. On Sam’s third birthday, the Rosenthals moved to Natchez, where Sam spent most of his childhood. After a short stint in New Orleans, Rosenthal moved to Rolling Fork in 1919 to help his brother Monroe with his clothing store. An outspoken gentleman, Rosenthal was elected as an alderman on April 8, 1924. A few months later, the mayor of Rolling Fork,a Jewish man by the name of J.B. Sinai, resigned after he moved outside the city limits. Although Rosenthal had no real interest in the position, future Governor and Rolling Fork native Fielding Wright nominated him as a mayoral candidate. Rosenthal’s remarkable mayoral tenure spanned from 1924 until 1969. Rosenthal was also a city judge and a charter member of the Lions Club, along with fellow Jews Sam Lamensdorf, Ed Danzig, and H.C. Glazier Jr.
Rosenthal brought business and innovation to the tiny Delta town. When he started his term, the town had no sidewalks, paved streets or recreational facilities. To drum up industry, he introduced a credit structure for the local lumber yard and and invested in a new generating motor in order to improve electricity in this rural Delta area. When the levees broke in the 1927 Great Mississippi River Flood, Rosenthal evacuated everyone on a train to Vicksburg before Rolling Fork completely flooded. At one point, the town was covered by seven feet of water. Rosenthal stayed throughout the ordeal and served as chairman of the Red Cross to restore the town. During the Great Depression, Rosenthal used the Works Progress Administration of the New Deal to the town’s advantage to pave the roads. After World War II, Rosenthal organized the Deer Creek National Gas District, which served five municipalities. He served as chairman of the district for nearly 15 years. Rosenthal also modernized Rolling Fork with schools and a library. During the 1960s, Rosenthal held community discussions to allay tensions during the civil rights movement. For all the successes he brought to Rolling Fork, the town designated July 11, 1968, as “Sam Rosenthal Day,” and later named the city hall after him. In 1969, Sam Rosenthal retired after loosing his reelection bid. He continued to work in his clothing store, “Mr. Sams”, close to his sister Bessie’s store, affectionately referred to as the “Pink Store.” In addition to his civic contributions, Rosenthal was also heavily involved in the local Jewish community, serving as president of the local congregation. An official congregation for Rolling Fork was not founded until the 1950s. Before that, most Rolling Fork Jews were members of the Hebrew Union Congregation in Greenville or Anshe Chesed in Vicksburg. Rolling Fork Jews created the Henry Kline Memorial Congregation as an offshoot of the Greenville congregation and it lasted almost forty years. Community Passover seders were held in the 1950s as well. Throughout much of the twentieth century, the Lamensdorf family was in business selling quality goods. The Lamensdorfs were a German family who settled in the Delta after coming to the United States. Benjamin Lamensdorf arrived first in the 1880s. His descendants married into the Grundfest family, who continue to farm cotton today at “the Grundfest place.” In addition to farming, the Grundfest roots also became intertwined with such people as Clarksdale’s Jack Ross of “The Style Shoppe” and Greenville’s Stein family known today for Stein Mart. Prosperous times in Rolling Fork did not persist as the twentieth century drew to a close. The town’s struggling economy lost industry except for a small textile mill. Like many Delta towns, Rolling Fork Jews left for opportunities elsewhere in larger cities with better jobs with higher wages. The Jewish community declined in number, and the Henry Kline Memorial Congregation closed its doors in 1992. They were on Main Street, but they were not mainstream. They carried a tagline, “They’re Jewish, you know.” That tag shaped my impression of the two families who had come to the Delta and made it their home. I could not write about my life without including my encounters with Jake Stern and Milton Fried, both merchants in Glen Allen, and their families. Their lives, as mine, had been lived out against the backdrop of a social structure that had been in place for hundreds of years, imprinting us with its requirements, requirements that made skin color the focus. Though we addressed all white adults as either Miss or Misters, we intoned it differently when addressing Jewish adults. Perhaps it was the tag line, “They’re Jewish you know,” that helped us understand or assume that Jews did not need those titles to survive. Nor did they need to belittle me, as others did, as I encountered the two families in their homes and in their stores. Somewhere in the mix of our daily living, a careful balance of identity existed. Always welcomed in the hardware store by the Frieds, I was taught Yiddish by the senior Mr. Fried and his son Milton so that I could help them with inventory. And I can tell you that counting penny nails in English or Yiddish is no fun. The South was built with penny nails, and I think that as a little boy, I counted every one of them. In my latest book, The Eight Habits of the Heart, I recall the respectful relationship between Mrs. Fried and her cook, Miss Hester, and I have warm memories of the Kosher food they cooked in the Delta, most of which I enjoyed. But I did not like the spongy soup called matzo ball. … Perhaps because of her memory of a world I didn’t know and persecutions I couldn’t imagine, I was left with a picture of Mrs. Fried as a gentle lady who looked remarkably like Golda Meir… She showed me through to a room that I recall to be a library off their carport. She never forced me to stand outside and talk to her through the screen door. She always held the door open for me, and I remember feeling welcome. Maybe her actions were guided by her own memory of being left out at a different place in time. When I came back to visit Glen Allen, I would always visit Mrs. Jake Stern, the Christian wife of a Jewish merchant. I have no idea if she converted to Judaism, but she was Jewish for all practical purposes because she was absorbed by the group. How Mrs. Stern may have been received by the broader white community will probably only be known to her and the aids who were privy to those private conversations on the subject As for me, however, I was her namesake, and was thus afforded a friendship and some of the best clothes that any little boy could have wanted, not hand me downs, but new clothes from Memphis purchased just for me. The Stern general store was big, at least to me at the time, and I recall always having brief conversations with Mrs. Stern’s husband, Mr. Jake, and their son, Buddy. These were somewhat like conversations with other white merchants, except a warmth etched in the tone, a remembered human warmth…When Mr. Jake died, his body was also brought to the white Methodist church where those of my race were allowed to attend. Jews were sidelined for their religious beliefs, but I have no memory of bold public threats against them, only bits of conversations from the maids and the handymen that overheard discussions of their personal hurt and the anger expressed within the walls. …little by little, my elders became aware of what the general community meant by the tag line, “After all they're Jewish,” the tagline that I now believe produced that delicate balance between us that I experienced as a child. Cash, William, “We have a fighting Spirit: Recollections of the flood of 1927 by South Deltans.” Delta Scene, 7, no: 8-10 (Spring 1980). “Federation of American Zionists.” The American Israelite, Oct. 29, 1903. Ferris, Marcie Cohen, “Feeding the Jewish Soul in the Delta Diaspora.” Southern Cultures, 58, no. 3 (Fall 2004): 52-85. Gordon, Mac, “Closing up Shop: Small Delta towns face fading sales.” The Clarion Ledger. Feb. 2, 1997. “Historical, Cultural and Architecture Heritage Questionnaire.” Rolling Fork subject files Mississippi Department of Archives and History. “Honored at Ole Miss.” The American Israelite. August 20, 1936. Robertson, Craig, “’Mr. Sam recounts years as Rolling Fork.” The Delta Democratic Times. October 1, 1976. “Succeeds Phi Ep Brother As Fraternities' Head.” The American Israelite. Dec. 16, 1937. Taulbert, Clifton, “They’re Jewish You Know.” Mississippi Jewish Record (March 1998).